The deadline to purchase tickets online for Ladies of Laughter on Sat, Sept 8th, 2018 has passed. Tickets may still be purchased at the door for $10 each, space permitting. 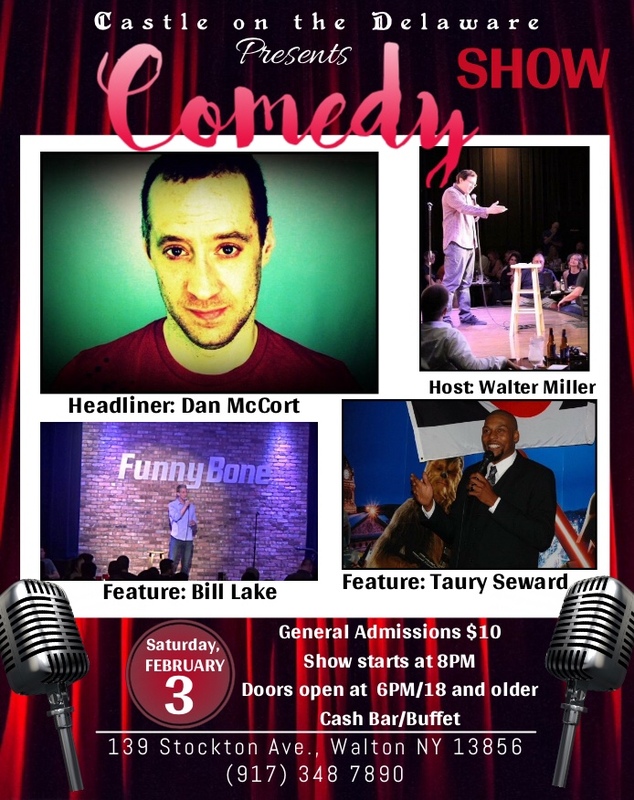 -Dark Humor is a specialty for Walter Miller, a Syracuse comedian with a knack for one liners and drawing discomfort from the crowd. Miller performs regularly across Central New York and Pennsylvania. He’s a Utica Brews Laugh Contest winner and participated in the Matty B’s Roast Battle series. Originally from Newport News, Virginia and now based out of Rochester, NY Mark Burks has worked up and down the east coast sharing his true-to-life humor with audiences of all kinds. Mark is known best for his roles in the not for profit, Combat Comedians, where he is an instructor and a performer, and opening for television, movie and radio well-knowns. He’s the funniest person you’ll ever forget. Ernesto “Big Ern” Galano is a staple in the Binghamton Comedy Scene Bringing his Raw Bronx N.Y. Attitude to the stage to keep you laughing. If he’s not personally making you laugh then he’s putting the talent together in a show to make you laugh. Love, Life And laughter Is his goal! Elliott Elliot is a comedian, soda drinker, fun haver and stuff doer from Scranton Pennsylvania. He’s a music fan with no musical talent and is armed with a vast knowledge of pop culture He’s performed stand up all over the place with all kinds of people, been in a few sketch shows.. He has appeared in the film The Family Business, and stars in the web series Creep City USA. Elliott believes that Quint from Jaws is the greatest character in any film ever! Thomas The Red is a stand-up comedian, and actor from the Northeastern Pennsylvania area. He is known for mixing a Viking themed stage presence into his stand-up comedy performance; including authentic viking weaponry! 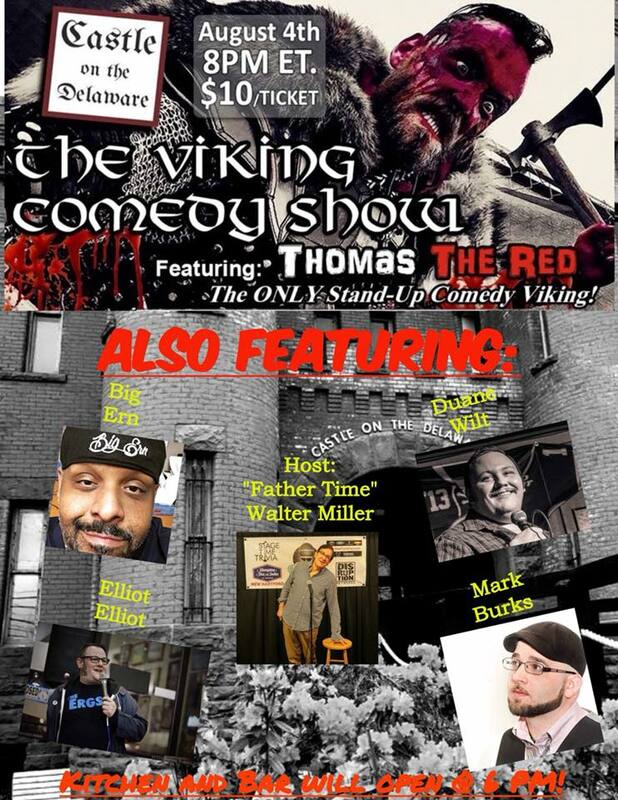 The deadline to purchase tickets online for The Viking Comedy Show on Sat, Aug 4th, 2018 has passed. Tickets may still be purchased at the door for $10 each, space permitting. 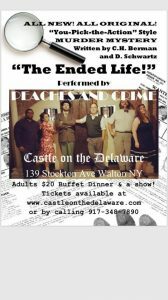 On Saturday June 2nd, 7pm to 10:30pm, The Castle on the Delaware in Walton, NY will present to you “The Ended Life”, an all new murder mystery show by “Peaches & Crime”. $20 for show and dinner. Dinner starts at 7pm and the show starts at 8pm. This is a “you pick the action” style interactive show and the audience participation/costumes encouraged. Be a part of the twists and turns of the show. Buy tickets online here to automatically reserve your seats upfront. Mixed green salad with blood red vinaigrette dressing. On the chopping block: Grilled beef tenders. Cash bar will be open for other drinks. The deadline to purchase tickets online for "PEACHES & CRIME - The Ended Life" on June 2nd has passed. Tickets may still be purchased at the door for $20 each. The Castle On The Delaware will host an Adult Comedy Show with 3 famous and funny comics on Saturday June 1st at 8pm. Buy tickets online on our website to reserve your seats upfront or purchase tickets at the door. $10/Ticket. Foods and drinks will be available for purchase starting at 6pm. Because we build our menu around the freshest ingredients available that particular week, it will be announced a few days prior to the event. 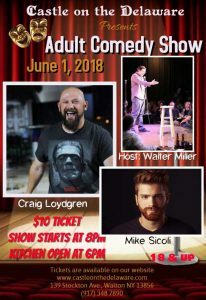 The deadline to purchase tickets online for "Adult Comedy Show" on June 1st has passed. Tickets may still be purchased at the door for $10 each, space permitting. 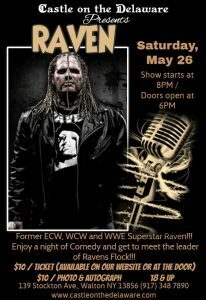 The Castle on the Delaware will present to you former ECW, WCW & WWE Superstar Raven Saturday May 26th with 3 more famous and funny comics at 8pm. Buy tickets online on our website to reserve your seats upfront or purchase tickets at the door. $10/ticket. $10 for photo and autograph. Foods and drinks will be available for purchase starting at 6pm. Because we build our menu around the freshest ingredients available that particular week, it will be announced a few days prior to the event. Raven will do 45 Minutes of Comedy and 45 Minutes of Question and Answers. Enjoy a night of Comedy and get to meet the leader of Ravens Flock!!! -Dark Humor is a specialty for Walter Miller, a Syracuse comedian with a knack for one liners and drawing discomfort from the crowd. Miller performs regularly across Central New York and Pennsylvania. He’s a Utica Brews Laugh Contest winner and participated in the Matty B’s Roast Battle series. Walter Miller performed up and down the coast, as well as Walton’s own The Castle. This event has been cancelled. Tickets are no longer available for purchase. 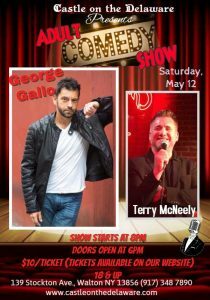 George Gallo and Terry McNeely two extraordinarily funny comics will hit the Castle stage Saturday May 12th at 8pm. Buy tickets online on our website to reserve your seats upfront or purchase tickets at the door. $10/ticket. Foods and drinks will be available for purchase starting at 6pm. Because we build our menu around the freshest ingredients available that particular week, it will be announced a few days prior to the event. Both acts deliver a high energy, edgy in your face delivery with a no holds barred approach. Feelings may be hurt but the truth and risk in subject matter is something missing in the landscape of today’s world of stand-up comedy. (NBC) The Apprentice, (NBC) Last Comic Standing, (A&E) Evening at The Improv, (A&E) Caroline’s Comedy Hour and (AXS) LIVE at Gotham Comedy Club to name a few. From Long Island, NY comes a fearless convicting duo of mayhem and comedy. The high energy acts of George Gallo and Terry McNeely deliver and dissect today’s culture with dignity and a blunt edge. Raised in the 1980’s in a world that hit their kids and played records backwards for hidden messages, these guys show audiences the world as it WAS and as it should BE. From the stand point of a guy with plenty of VICES and a guy with many VOICES strap yourselves in for a night of unique, unbridled stand-up comedy. The deadline to purchase tickets online for "Adult Comedy Show" on May 12th has passed. Tickets may still be purchased at the door for $10 each, space permitting. 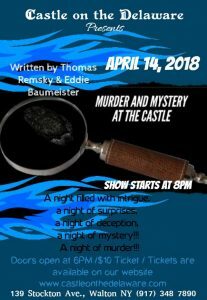 The Castle on the Delaware will host a Murder Mystery Show on Saturday April 14th. This show was especially written for this event by Thomas Remsky and Eddie Baumeister and contains a lot of twist & turns and surprises. Show starts at 8pm. Buy tickets online on our website to reserve your seats upfront or purchase tickets at the door. $10/ticket. Family discount; children under the age of 18 are free with an adult. Foods and drinks will be available for purchase starting at 6pm. Because we build our menu around the freshest ingredients available that particular week, it will be announced a few days prior to the event. The deadline to purchase tickets online for Murder and Mystery at the Castle on April 14th has passed. Tickets may still be purchased at the door for $10 each, space permitting. 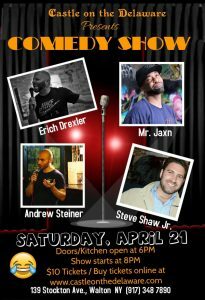 Comedy Show with four hilariously funny comics Saturday April 21st 8pm to 10.30pm at the Castle on the Delaware. Kitchen opens at 6pm. The special menu for this event will be advertised around 5 days before the show. Buy tickets online (below) to reserve your seat or call us now at 917-331-7670 to reserve your seat upfront. A DJ party (3 DJ’s, 10.30pm to 3am) follows the comedy show and everyone is invited to join the party. Erich Drexler is from Scranton PA and a regular host of the Open Mic Circus at The Keys. One of the founders of StreetKar Comedy out of Scranton, He is a high energy come mic mixed with an angry filter and colorful language. Together, they energize any room he performs in. He will perform for food. Huge Bruce Willis fan. Andrew Steiner is the host of The Weirdball Podcast. He performs regularly at New York Comedy Club, Laugh It Up, and Instagram (@andrewbsteiner). The deadline to purchase tickets online for the Comedy Show on April 21st has passed. Tickets may still be purchased at the door for $10 each, space permitting. 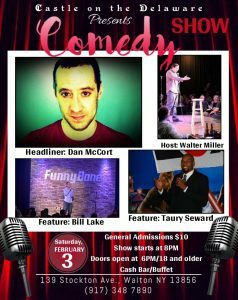 Saturday February 3rd Castle on the Delaware will present a super funny Comedy Show featuring 4 comedians. Doors will open at 6pm and food and drink will be available. Show will start at 8pm. General admission $10, ages 18 and over. See form below to buy tickets online. Headliner Dan McCort: NYC Stand-Up Veteran of 12 Years. Currently operates out of Central New York. He has a reputable YouTube following, with over 80 blogs worth of content and 2+ hours of stand-up, including his first hour special, “Audible Toxicology”. He was First out of 48 in the first annual Unforgettable Stand-Up Comedy Challenge. And he went on to perform in The Boston Comedy Festival. He also will be publishing his first book this year. Host Walter Miller: Dark Humor is a specialty for Walter Miller, a Syracuse comedian with a knack for one liners and drawing discomfort from the crowd. Miller performs regularly across Central New York and Pennsylvania. He’s a Utica Brews Laugh Contest winner and participated in the Matty B’s Roast Battle series. Feature Bill Lake: Bill has written jokes for The Late, Late Show with Craig Ferguson and the Late Show with David Letterman, as well as the few shows without “Late” in the title- The Tonight Show, Saturday Night Live, Real Time with Bill Maher and the Sport Show with Norm McDonald. Feature Taury Seward: Won Who’s Got Next? Rochester tournament that is a regular at Matthew B’s and Spotlight. He works steadily around New York and Pennsylvania and enjoys Bob Dylan, spam and amusement parks is a crowd favorite and always helpful at the grocery store. The deadline to purchase tickets online for "The Comedy Show" on Feb 3rd has passed. Tickets may still be purchased at the door for $10 each, space permitting. Our 6th annual New Year’s Eve gala will take place December 31st 9pm to 1am. Robert Kosty from Batavia NY will perform his show called “Your Daddy’s Rock’n Roll”. Ronald Gadson aka “DJ Enoch” from NYC will make sure that you spend most of the evening on the dance floor. Our grand buffet will include a salad bar, soup, a herb crusted prime rib au jus, a chicken dish, many vegetarian dishes and sides, desserts, coffee and tea and a champagne toast at midnight and starts at 8pm. Online tickets are no longer available. Admission is available at the door for $25 each, space permitting.